I know, I know: Show, don’t Tell. And never ever use Talking Heads and As You Know, Bob dialogue to get your story out – and into the head of your readers. I was so proud of myself for avoiding the above pitfalls, that I was baffled this morning when I realized that the only way to write the current scene was to have it told, one character to another, in a static situation. The thing is, like all writing ‘rules’ (they really ought to be labeled suggestions, for the damage they cause otherwise), this is another one which can be broken, to great effect, when the breaking is done deliberately and with intent and skill. Whew! Go for it. Break lots of them rules while you’re at it: the general rule is, if you’re writing third-person multiple pov stories, that the viewpoint character for a scene is the one most affected by the scene. But this scene is different! I may be wrong. Someone may write to me after I publish 19.3 and tell me I did it all wrong, and there was a perfectly valid way to do it within the confines of standard practice. Caveat #1: You can’t do this very often in a story. The story as a whole must still show much more than it tells. Caveat #2: You can’t do this in the beginning. The problem with so many beginnings is that we don’t care about the characters yet, and we are going to care even less about something boring they tell someone else. Caveat #3: You can’t do this without a lot of preparation. The reader must be literally panting for you to provide the information, because you’ve been dropping hints and pieces all along. Caveat #4: There has to be a very strong emotional motivation. Characters have to have very good reasons for dumping in one chunk something they’ve been reluctant to let out. Caveat #5: The setting must be perfect. Because setting is not the focus of the scene, but the reader has to know exactly where the scene is happening. Caveat #6: The scene must be static. Nothing else can be allowed to penetrate the occasion. At most, the character hearing the story can interject a careful question to keep the story moving. The whole focus of the scene has to be on the story being told. Caveat #9: It can’t be at the climax of the story. There are far more important things to do at the climax. And you don’t want to tie character’s hands with all these restrictions at a climax. Caveat #10: There must be no better way to write the scene. You don’t blow all the rules for no reason. Caveat #12: Select the wrong point-of-view character. Or, rather, don’t select the obvious character, the one that makes the most sense, the character most affected by the scene. This one I had to think about quite a lot, because it was definitely counter-intuitive. Complicating matters – who tells the story? Because, ultimately, by the time you get to this kind of a scene, both characters are going to be well-known to the reader, and the reader needs to be shooken up – climax and story end will follow, and the reader DOESN’T know everything. Readers only THINK they know everything. They would actually rather be surprised. I remember listening to the audiobook of Our Lady of the Forest, by David Guterson (author of Snow Falling on Cedars), getting closer and closer to the end of the story, leaving himself absolutely no way out of the looming disaster, and me wondering how the heck he was going to give me an end which FIT the story – and was SATISFYING. It seemed to me only one of those goals could be fulfilled, and I was not looking forward to hearing the hand-waving that would be necessary to ‘splain things to the reader. And then being absolutely flabbergasted by how he DID. That’s my goal, getting to the end of Book 1, that its end must both FIT and be SATISFYING. So I chose, for this scene I’m talking about, 19.3 (watch for it), to tell the little tale from the pov of the wrong character – and find other ways for the character most affected to express that effect. It occurred to me, that, because this is so far into the story, that the Reader STANDS IN for the character most affected – because by this point the Reader KNOWS that character so well that when the non-pov character has no interior monologues, and is allowed minimal dialogue, the effect is going to happen in the READER. At least I hope so, and have planned it so. MY readers will tell me if I achieve it. This entry was posted in Writing - how to and tagged characters, contract with reader, Hard choices, Pride's Children, writing on January 15, 2015 by Alicia Butcher Ehrhardt. You know those extra-scenery notes I keep talking about writing every time I write a scene? The ones where I write about writing, and end up with 10-20 words written per word of finished fiction? Well, I thought I’d mine some of them for blog posts about the writing process itself. “Just a minute, though: I had an interesting conversation with MM on Wattpad: she doesn’t like Andrew. That is an important difference. To capture more of the market, I need to at least THINK of all the people who DON’T like Andrew – and what he stands for. They need to be able to like Andrew because Kary does, even if they don’t see it themselves. When you create characters, you HAVE to let the readers form their own conclusions about those characters. Once you write things as well as you can, make your case as compelling as you can, it is OUT OF YOUR HANDS. The author doesn’t get to sit on the reader’s shoulder, pointing out what the reader should feel, and how the reader is missing the author’s point, or how this character will be revealed later as better (or worse) than he/she appears at this point in the story – or any other little thing the author DIDN’T put in the story. Or merely any little thing that the reader and the writer will DISAGREE on. Lots of people wonder what the heck Jane Eyre saw in Mr. Rochester – they don’t get it. He is rich, mean to poor Jane, willing to be a bigamist, entitled, rude, whatever. And some of us – lots of us, apparently, or it wouldn’t still be read – get that the attraction is Jane, and how she loves, and that SHE is what makes HIM attractive, because she is attracted to HIM and we love HER. Her gentle way with words, her ruthless self-examination, her faith: he can’t be that bad if SHE loves HIM. And ultimately redeems him by holding HIM to HER standards. What do you do when readers don’t see it your way? But back to how this applies to whether all your readers will like all your characters, or react to them the way you want your readers to react. Just because some readers don’t like Andrew doesn’t mean there won’t be plenty of readers who do. The conversation with MM reminds me that some people don’t like Andrew – they find him arrogant and entitled and self-centered. I find him way too healthy. But I love him – and half my readers may not. Which just means that KARY will have to carry the weight of PC for them. IF they read, it will be because they identify with HER, and SHE loves Andrew with a passion she can almost not explain. ONE strong character can carry a story. Some people will even identify with Bianca, and think I’m being horribly mean to her. I can’t be all things to all people, but with 7 BILLION people on the planet, I still ought to be able to find a few readers. Maybe the people who don’t like Andrew WILL like my writing enough to read. Whereas maybe people who read badly-written genre work somehow like the protagonists enough to forgive the bad writing. Must be the case in some readers – how else do you explain it? Real world, Alicia. Real world. MY TASTES ARE PARAMOUNT. For MY writing only, of course. Which is exactly the same thing the literary writers/readers say – and I think they’re plotless hacks. Well, there’s little chance I will try to join them – I can’t write either literary or genre. Duh. You write what you are, what you have made yourself out of all the writing you’ve read, plus the teaching you’ve had (heavily biased by whether you like the TEACHER enough to listen), plus everything that has happened to you and how you interpret it. Goes right back to: you write what you are, even when you think you’re being clever and hiding yourself as an author. Which wildly popular characters do YOU find completely unlikeable? This entry was posted in Free fiction - mine, This writer's life, Writing - how to and tagged characters, contract with reader, Pride's Children, serialized novel, the creative process, writing on January 9, 2015 by Alicia Butcher Ehrhardt. After all is gathered, BECOMING the character, again, if the alternation between scenes leads me to the head of a different character, is the fun part of writing. There is a reason for the point of view switch: something important is going to happen, and this is the character who will be most affected (which is why I chose her/him to tell this part of the story). And by the time I’ve gathered all the parts of WHAT will happen in this scene (that’s the ‘extreme plotter’ part of my writing process), I now get to write the scene, the HOW and the WHY of it, from this character’s viewpoint. I am perfectly capable of writing long parts from a single pov in both first and third person – I’ve done both. But I’ve chosen to switch between Andrew, Kary, and Bianca in Pride’s Children because, well, it fits the story, and it works for me. But I often forget, and discover with surprise, that getting back into a different character’s pov is fun for me, the writer. You’d think I would have figured it out by now, but there are so many other parts to writing that I have to pay attention to that I seem to forget, while intensely involved in one scene and one character’s head, that I can and will switch. While Andrew has one pair of scenes in a row at the beginning of Pride’s Children because it is necessary (and the way a TV interview flows), Kary is the character who gets all the rest of the scenes in Book 1 where the pov doesn’t change when going to a new scene. This is necessary because, in the story, though Andrew has farther to go, Kary is much harder to change. And you wouldn’t believe the change if I didn’t show you the pieces, so I have no choice: I have no patience with books where a character makes a major personality change for the convenience of the author and the plot, and you’re just supposed to take it (UNwilling suspension of disbelief) so the writer can get on with the story. Somewhere in the deep recesses of my brain, a switch gets set to ‘disbelief’ and the rest of the story is now fake. I may enjoy the story – and finish reading it – but I will never read it again to savor the character or the storytelling the way I do with books which dissect the change path. I learned this from the good ones. I was rereading Dune last night and Busman’s Honeymoon (Dorothy L. Sayers) the night before, and it seems that it doesn’t matter how many times I go back to them, I get sucked in to enjoying the character-development steps all over again. Maybe because that’s how the authors made me care about the characters in the first place – and I DO care about Paul-Muad’dib and Peter Wimsey, long dead and never real in the first place. Because getting into the skull and under the skin of a character, so I can look out through the eyes, hook into all the senses, and listen to the dialogue and thoughts, is basically the same effect I hope to elicit in a reader, an indispensable part of the process is to go back and read the last couple of scenes from the pov of this scene’s character, SKIPPING any intermediary scenes from other characters viewpoint. It is an odd exercise, seeing the story ONLY from one character’s pov, but an oddly satisfying one as well, because by the time I get to the actual writing phase, dialogue, thought, and movement are coming back to me in the way it must be for an actor returning to an old familiar role: this is how the head moves, this the habitual tone of voice, and the words another character might use do not fit. I told one of my readers that I’m a frustrated actor. I have neither the ability nor the stamina for theater, especially in real time. But it’s amazing how the other characters in this story fade, once I boldly seize the controls in this one’s head – and scary how my real self becomes subsumed in the virtual one. Reader or writer – do you feel when this happens? This entry was posted in Gen. Musings, Writing - how to and tagged characters, contract with reader, Pride's Children, the creative process, writing on January 4, 2015 by Alicia Butcher Ehrhardt. This entry was posted in CFS - living and writing with ME/CFS/CFIDS, Free fiction - mine, This writer's life, Writing - how to and tagged characters, contract with reader, plot holes, the creative process, writing on October 5, 2014 by Alicia Butcher Ehrhardt. I have come along to someone’s blog when I became aware of them, read a post from 2008, and been delighted because it was just what I needed. I’m not promising you delight, mind you – just the things which tickle my fancy (good) or keep me from writing fiction today (bad). This entry was posted in CFS - living and writing with ME/CFS/CFIDS, Writing - how to and tagged characters, contract with reader, plot holes, the creative process, writing on June 23, 2014 by Alicia Butcher Ehrhardt. I think readers of blogs – and search engines – are attracted to the ‘X tips to do Y’ kinds of posts. I think it’s because they find the idea of a quick and dirty list they can check their own opinions against quickly – by the titles alone if necessary – appealing. And, if they’re like me, they wonder if they’ll pick up at least one usable tip – which would make skimming the post (ie, reading the subtitles in the list) worth their time. Unlikable actions by likable characters? 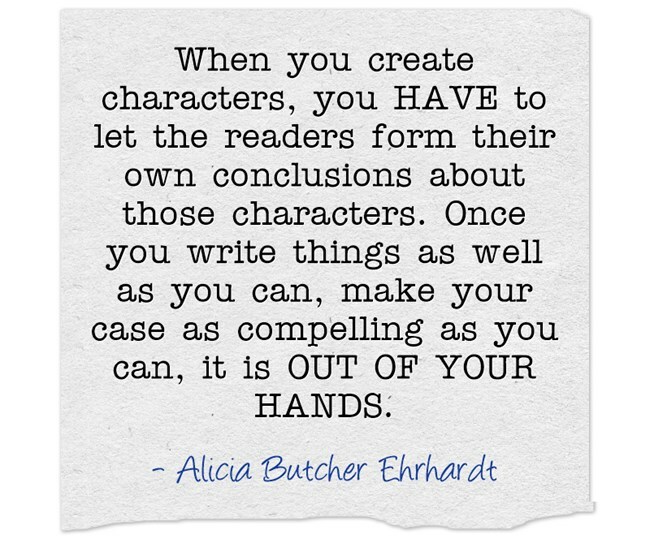 This entry was posted in Writing - how to and tagged characters, contract with reader, Hard choices, the creative process on June 11, 2014 by Alicia Butcher Ehrhardt. 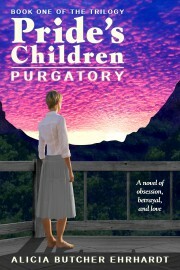 Many novels, including my novel-in-progress, Pride’s Children, are written with a multiple point of view (pov). I have three characters who get turns, two women (Kary and Bianca), and a man (Andrew). Sometimes this is done by giving each character a chapter at a time. I prefer, in the WIP, to tell each scene in a chapter from the pov of the character who has the most at stake – but with no particular rotation. The story dictates who tells it. More than half of the time, the next scene, after I finish writing or polishing the current one, will be in the pov of a different character. In writing the 26 scenes in the five beginning chapters, I switch to a different pov 16 times. This entry was posted in Writing - how to and tagged characters, contract with reader, Dramatica, the creative process, writing on June 6, 2014 by Alicia Butcher Ehrhardt. It’s the Ides of March, and it’s been a long time since it wasn’t really possible to go out and do much gardening until this late in the year (not that I went out, mind you – but I always told myself I SHOULD get out there before the weeds got started, etc., etc.). When you’re disabled – and trying to use your available brainpower and energy for writing fiction – there isn’t a lot left at the end of the day, and the DECISION to go out is very hard to make. 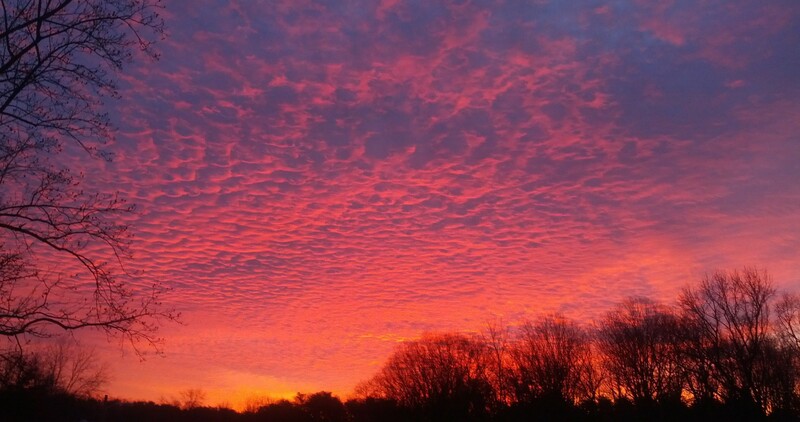 However, I almost always find that I’m glad I did – when I get out for a while. This entry was posted in Gen. Musings, This writer's life and tagged characters, inspiration, Life, the creative process on March 15, 2014 by Alicia Butcher Ehrhardt. It isn’t even the snowiest winter on record, but I will have to drive home into a huge storm. I sit in my daughter’s living room, looking out at the crusted snow. I have never seen anyone out this window, and today the yard is covered in deep snow. A round-faced teen boy is walking toward me down the hillside, toward the chain-link fence at the edge of her yard, taking careful steps in the deep snow. This entry was posted in Gen. Musings, This writer's life and tagged characters, inspiration, Life, the creative process on March 14, 2014 by Alicia Butcher Ehrhardt. I think I’ve figured out another roadblock. As I’ve been working on what is close to the final draft of Pride’s Children, I am getting more and more into the territory of a true first draft – scenes I wrote but which have little in the way of polish. Maybe my own limitations has made this extra hard – the ‘big picture’ is a composite of story pixels, only one of which I examine at a time. This entry was posted in CFS - living and writing with ME/CFS/CFIDS, This writer's life, Writing - how to and tagged brain fog, characters, Hard choices, Pride's Children, the creative process, writing on December 7, 2013 by Alicia Butcher Ehrhardt. Nobody said writing was going to be easy. When I designed my writing career – back in the 1960s and 1970s – it was something I would do when my main career (physics – yes, I knew that before I was 12) was over, and I could retire to do whatever I wanted after a long and productive life of work. This entry was posted in CFS - living and writing with ME/CFS/CFIDS, Gen. Musings, This writer's life and tagged CFIDS, CFS, characters, ME/CFS, writing on December 5, 2013 by Alicia Butcher Ehrhardt. One of the things that happens when you write the book you want to read – standard advice for newbies – is that you question your motives. This entry was posted in Gen. Musings, Writing - how to and tagged characters, inspiration, the creative process, writing on December 2, 2013 by Alicia Butcher Ehrhardt.